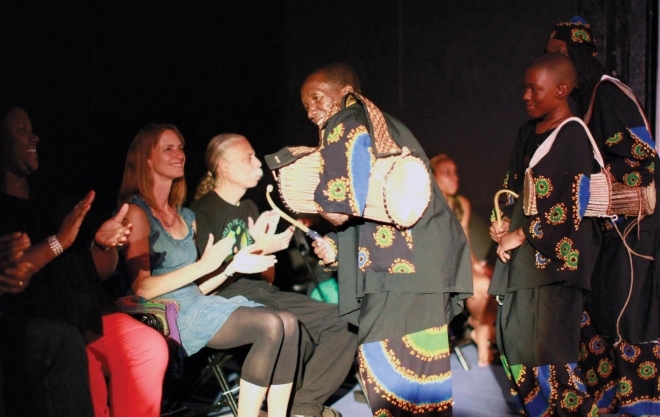 Cincinnati’s Bi-Okoto (pronounced “Bee-O-Ko-Toe”) Cultural Institute, a nonprofit performing arts organization that illuminates Africa’s rich traditional heritage, recently won the African Professionals Network (APNET) award for African culture, community and entertainment. The Pleasant Ridge-based organization engages individuals through dancing, drumming, music, food, languages and other arts. Ade founded Bi-Okoto to answer those questions, and it now boasts a tremendous repertoire with more than 90 authentic dances, music, dance dramas, operas and new contemporary works from countries such as Nigeria, Ghana, Kenya and South Africa. “You can call us the Afrocentric YMCA in Pleasant Ridge,” Ade says with a chuckle. Through this organization, he has successfully shared Africa’s heritage with not only the community, but the entire world. For instance, the organization has been to Europe and back — three times. Bi-Okoto received the high honor of being selected by the United States Department of Defense Armed Forces Entertainment for a five-and-a-half-week military tour of Europe in 2003, ’04 and ’05. Seven artists performed in the United Kingdom, Norway, the Netherlands, Germany and Belgium in honor of Black History Month each of those years. Aside from the military tour, the artists have also traveled internationally, representing Nigeria in South Korea’s Youth Festival and performing at presidential welcomes in Italy, Germany, Bulgaria and France. Bi-Okoto has also performed in 48 U.S. states, including Georgia for the 1996 Summer Olympics in Atlanta. Despite all of the touring, Bi-Okoto is proud to call Cincinnati its home. The organization has moved around several times within the city but settled into its new location on Montgomery Road in Pleasant Ridge last January. “Finding this space was the big blessing in disguise because it can truly house the type of cultural center we would like the organization to represent,” Jeaunita says. The building has undergone an incredible transformation since January, with renovated administrative offices, a dance studio, classrooms, a cafeteria and more, including a full theater still in transition, with only two of the seven levels of seating in place. Bi-Okoto will host its annual Heritage Festival at the Pleasant Ridge center this Saturday. “The day is filled with classes and an African bazaar with vendors for clothing, jewelry, baskets and purses, along with African dishes and beverages. The evening comes together with a command performance from some of the same artists you take classes from,” Jeaunita says. “We have Salsa, traditional dances for Orisha and music such as Reggae and Afrobeat. There will also be storytelling, visual arts and more,” Ade adds. Jeaunita explains that the traditional dances come from the artists’ tribes back at home that have been passed down. “We are fortunate to have people who are born and raised from different African tribes, so it’s the family heritage,” she says. Although Bi-Okoto reached more than 180,000 adults and children in 48 states with its programming in 2012, Ade believes there is still work to be done.